A solar controller is an essential component of a marine solar system. A controller gathers the maximum amount of power from the solar panels and delivers the proper amount of power to the battery bank for efficient charging and ensures the batteries are not overcharged. Pulse Width Modulated (PWM) controllers are excellent for smaller solar systems under 300 watts. They are cost effective and use little power. Our PWM controller is designed for charging two battery banks; ideal for cruising sail and power boats. 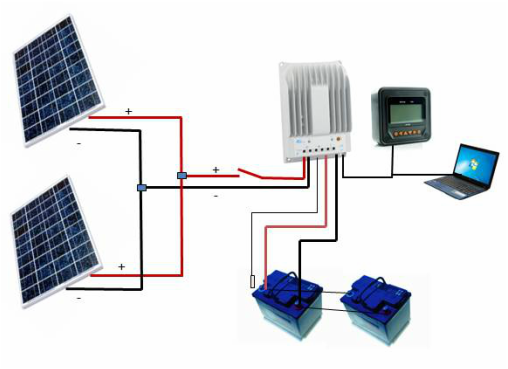 Maximum Power Point Tracking (MPPT) controllers are designed to pull the maximum power off a solar system and adjust the charging voltage and current to achieve maximum battery charging efficiency. 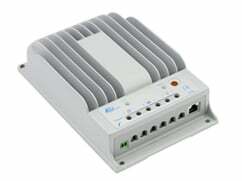 MPPT controllers are ideal for solar systems above 200 watts in rated output. The EP Duo PWM marine controller is designed specifically for charging two independent battery banks. It is easily programmed for amount of charge to each bank. An external display provides information on solar panel output, battery state of charge and much more. Both the Tracer BN and Xtra marine series controllers are EP Solar’s second generation of MPPT controllers. Both have rapid MPP (Maximum Power Point) calculation capability to achieve the maximum output of a solar array. At 99.5% efficiency they are one of the most energy efficient controllers available which means they will convert the maximum amount of solar energy to battery charging power. These controllers also have extensive communication ability. You can monitor your solar panel performance through your laptop computer or through the MT50 remote display. An option to monitor solar system performance through Bluetooth or WiFi is also available. Tracer BN - The die-cast aluminum design ensures excellent heat dispersion; no heat dissipating fans are required. 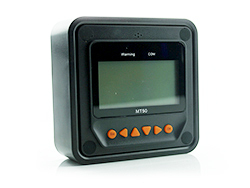 The Tracer BN package includes the MT50 remote display. The Tracer BN can be programmed from the MT50 remote display or from a computer connected via special cable. Xtra-N - The Xtra series controllers include a built in display providing the same information as the MT50 remote display although the MT50 is an optional accessory. The Xtra is designed to manage Lithium ion and LiFePo4 batteries as well as the standard flooded, AGM and sealed batteries. The Xtra can be programmed from the built in display, the MT50 remote meter, a Bluetooth smart phone app or a computer connected via special cable. Compared to conventional PWM controllers and depending upon the performance characteristics of the solar array, MPPT technology may increase the solar system charge efficiency up to 30% and potentially decrease the power of the solar array required.